A retro hors d’oeuvre that’s always guaranteed to please. 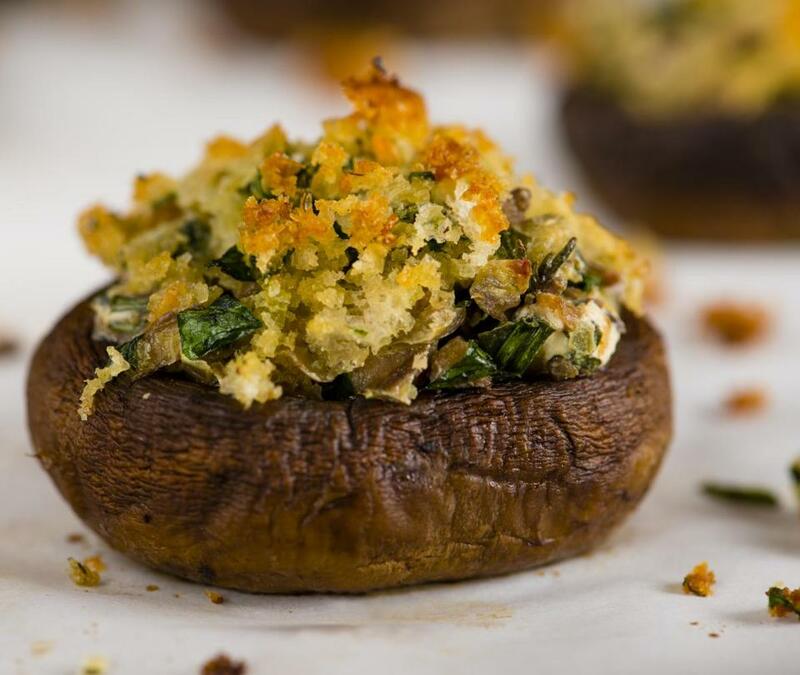 Baked stuffed mushrooms with parmesan and herbs. The holiday party season, which is about to go full tilt, brings a parade of hors d’oeuvres, both modern and retro. Stuffed mushrooms fall squarely into the latter category, and deliciously so. Boasting a meaty texture and woodsy flavor, especially when roasted, mushrooms make a great base for fillings with a wide range of flavors. These recipes feature Parmesan and herbs, broccoli rabe and lemon, and chorizo and smoked paprika. If you have any stuffed mushrooms left over, they’re a great accompaniment to scrambled eggs for breakfast. This recipe’s components can be made ahead and refrigerated — either assembled or separately — for up to three days. TIP: Mushrooms shrink when they roast, so it’s important to buy large ones, with roughly 2-inch caps. And think about buying an “insurance” mushroom or two in case you break a cap when separating the stems. If there are no mishaps, just chop up the extra for filling. With the rack in the middle position, heat the oven to 425 degrees. Line a large rimmed baking sheet with foil, then set a wire rack in it. Spray the rack with nonstick cooking spray. In a very large bowl, vigorously whisk 2 tablespoons oil, the lemon juice, ½ teaspoon salt, and pepper to taste. Add the mushroom caps and toss gently to coat. Arrange the mushroom caps gill side up on the rack and roast until they shrink slightly and fill with liquid, 15 to 18 minutes. Pour off the liquid in the caps, turn them gill side down, and roast until browned and tender (but not dry or leathery), 6 to 10 minutes longer. Remove them from the oven and set aside (leave the oven on). Meanwhile, in a medium bowl, whisk 1 tablespoon oil, 1½ teaspoons garlic, ½ teaspoon salt, and pepper to taste. Add the bread crumbs and 2 tablespoons parsley, toss until the crumbs are evenly (though barely) moistened, and set aside. In a medium skillet over medium heat, heat the remaining oil until shimmering. Add the chopped mushroom stems, shallot, thyme, and ½ teaspoon salt, and cook, stirring, until mixture is softened and browned, about 10 minutes. Add the remaining 1½ teaspoons of garlic and cook, stirring, until fragrant, about 45 seconds. Add the wine and cook, stirring, to cook off the alcohol and thicken the mixture slightly, about 1½ minutes. Scrape the mixture into the now-empty large bowl and cool to room temperature. Add 1/3 cup of the bread crumb mixture, the remaining parsley, chives, Parmesan, cream cheese, ¼ teaspoon salt, and pepper to taste, and mix until uniform. Taste the filling and adjust the seasoning with salt and pepper if necessary. Turn the mushroom caps gill side up and divide the filling evenly among them (about 1 heaping tablespoon per mushroom), pressing the filling into each cap. Dip the mushrooms filled side down in the remaining bread crumb mixture, pressing lightly to coat, and arrange filling side up on the rack. Roast until the filling is hot and the crumb topping is crisp and light golden brown, 15 to 20 minutes. Serve at once. 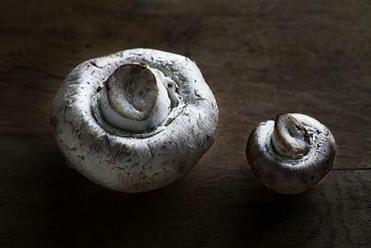 1) Decrease chopped mushroom stems to 1½ cups. Increase the garlic to 1½ tablespoons. Decrease the chopped parsley to 2 tablespoons, omitting it from the filling. Omit the thyme and chives from the filling. Substitute coarsely grated pecorino Romano for the Parmesan. 2) Trim the thick stems from 5 ounces broccoli rabe and roughly chop thinner stems, leaves, and florets. Fill a large bowl with ice water. In a large saucepan, bring 1½ quarts of water to boil. Add ½ teaspoon salt and the rabe, and cook until tender, about 2 minutes. Drain, place in the ice water, cool for 2 minutes, and drain again. Spread out a clean dish towel, place rabe in the center, gather the edges and corners, and twist to wring out as much liquid as possible. Empty the rabe into a bowl, break it up with your fingers, chop it very fine (you should have about ¾ cup), and set aside. 3) In the chopped mushroom and shallot mixture, increase garlic to 1 tablespoon. Along with the garlic, add ½ teaspoon crushed red pepper flakes to the mixture. Cook and cool the mixture as directed. 4) Mix the rabe, pecorino Romano, and 1½ teaspoons finely grated lemon zest into the chopped mushroom-shallot mixture along with the bread crumbs and cream cheese. Fill, coat, and bake the mushroom caps as directed. You want fresh chorizo, which may be labeled Mexican-style, for this recipe rather than Spanish chorizo, which is a dry sausage. 1) Decrease the quantity of chopped mushroom stems to 1½ cups. Increase the garlic to 1½ tablespoons. Increase the parsley to ½ cup plus 2 tablespoons. Omit the chives. Substitute beer for the wine and finely crumbled queso fresco for the Parmesan. 2) In a medium nonstick skillet over medium heat, heat about 2 tablespoons olive oil until shimmering. Squeeze a 5-ounce fresh chorizo from its casing into the skillet (discard the casing) and cook, stirring and breaking up the meat as fine as possible, until no longer pink, about 3 minutes. Remove to paper towels, leaving behind the fat and juices. When cool enough to handle, chop the chorizo very fine (you should have about 2/3 cup) and set aside. 3) In the chopped mushroom and shallot mixture, increase the garlic to 1 tablespoon and the parsley to ½ cup. Along with the garlic, add ½ teaspoon smoked paprika to the mixture. Cook and cool the mixture as directed. 4) Mix the chorizo and queso fresco mixture into the mushroom and shallot mixture along with the bread crumbs and cream cheese. Fill, coat, and bake the mushroom caps as directed.